Northern Strands, safety is one of our top priorities. Therefore, knowing how to properly clip wire rope using Crosby clips is very important in order to practice safe rigging. Keep in mind that the wire rope clip must be the correct size for the diameter of the rope that is being used and that there is a specific number of clips that are required according to rope size. A quick rule of thumb for proper clip installation is, "Never Saddle a Dead Horse". This refers to the live end of the wire rope that rests in the saddle of the forged wire clip and the U-bolt that is placed on the dead end of the wire rope. 1. Turn back specified amount of rope from thimble or loop. Apply first clip one base width from dead end of rope. Apply U-Bolt over dead end of wire rope – live end rests in saddle (Never saddle a dead horse!). Use torque wrench to tighten nuts evenly, alternate from one nut to the other until reaching the recommended torque. 2. When two clips are required, apply the second clip as near the loop or thimble as possible. Use torque wrench to tighten nuts evenly, alternating until reaching the recommended torque. When more than two clips are required, apply the second clip as near the loop or thimble as possible, turn nuts on second clip firmly, but do not tighten. 3. 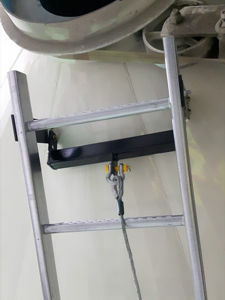 When three or more clips are required, space additional clips equally between first two – take up rope slack – use torque wrench to tighten nuts on each clip evenly, alternating from one nut to the other until reaching recommended torque. 4. If a pulley (sheave) is used in place of a thimble, add one additional Fist Grip. Fist Grip spacing should be as shown. For more information on wire rope and wire rope clip installation, please contact us!